Tuolumne Meadows Lodge is a great home base for day hikes throughout Yosemite National Park, offering rustic accommodations in an incredible sub-alpine meadow in the Sierra Nevada Mountains. Book Online. Tuolumne Meadows Lodge Yosemite National Park offers the visitor great lodging at an elevation of 8,775 feet, with plenty to do and see nearby. For those seeking a High Sierra experience, you can embark from here into the backcountry. Yosemite Tuolumne Meadows Lodge is located close to Yosemite National Park’s eastern entrance on Tioga Road. It is approximately 60 miles from Yosemite Valley. This area is a popular spot for hikers starting their journey into the backcountry of Yosemite. There are backpacking trips and day hikes to choose from. One popular trail is the 8-mile hike to Cathedral Lakes. Move through forest and meadows and marvel at Cathedral Peak looming in the distance. The Tuolumne Meadows Stable offers horseback or mule rides for visitors, giving them an easy yet thrilling way to see Yosemite. Those who wanted to protect the Sierra Nevada used historic Parsons Lodge, built in 1915, as a meeting place. It also served as a reading room and library, and as an access point for backpacking. Here you can see exhibits during the summer months. Next to Parsons Lodge, you can see the Macauley Cabin. It was originally the homestead of Jean-Baptiste Lembert, but was purchased in 1898 by the Macauley brothers. Soda Springs may seem unimpressive next to the spectacular waterfalls, lovely lakes and streams throughout Yosemite, but it’s a nice hike to this location and this naturally carbonated spring attracts deer and birds, particularly at sunrise and sunset. It’s a great way to explore Tuolumne Meadows. Here is lodging fit for anyone who wants to explore Yosemite National Park. The lodge is typically open from the end of June to mid-September, depending on weather. The 69 tent cabins accommodate up to four people, have metal frames, concrete floors and canvas coverings. You’ll find linens, candles for your lighting (no electricity), a wood burning stove and wood. Showers and restrooms are located in the center of the camp. Although there are no private cooking facilities, you can get a hearty breakfast and dinner in the central dining tent. 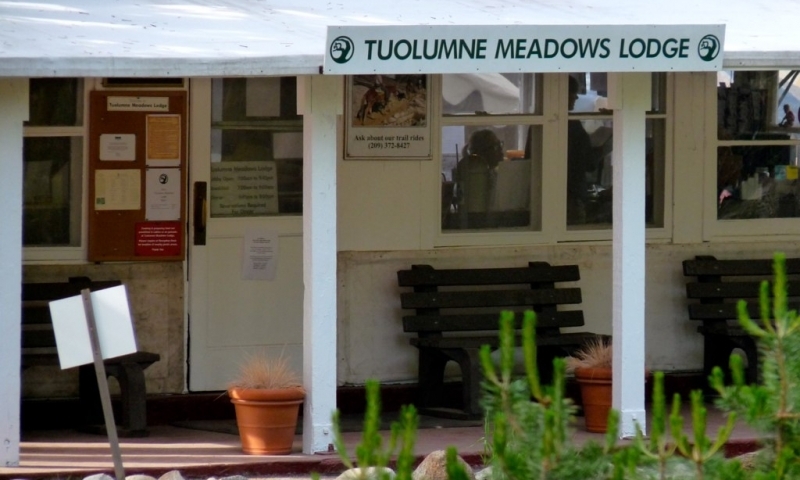 Tuolumne Meadows Hotels reservations can be made by calling 888-413-8869 or Book Online. Area lodges are listed in our Yosemite Lodging Guide.